It all started with birds. I cannot remember a time when I was not fascinated by them. At four-and-a-half I realised I could capture them by drawing them! 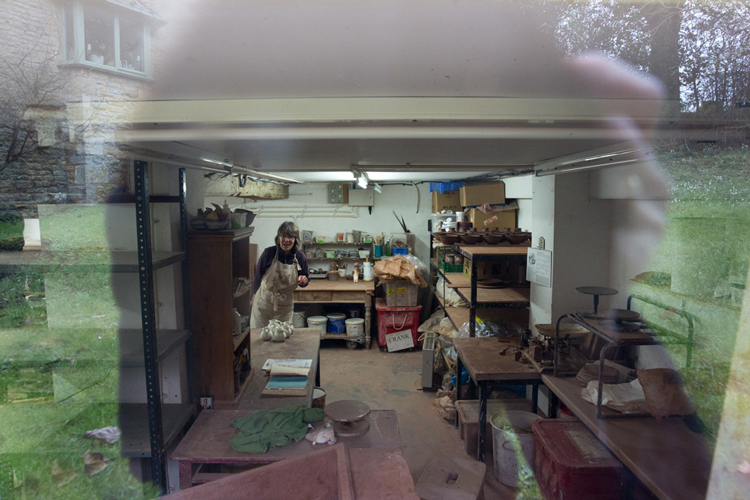 I went to Bournemouth and Poole College of Art where I studied ceramics for three years under the tutelage of two wonderful potters, David Ballantyne and Peter Stoodley. They taught us everything from the geology of clays to modern factory methods - and everything else in between! After working for a short while as a thrower in a cotswold pottery, I opened my first workshop near Banbury in 1970. My present workshop just outside Chipping Norton was opened in 1999, after a long break bringing up three children! I employ a blended red Staffordshire clay to make a wide range of tableware. I think of myself as a traditional potter continuing the skills of an ancient craft, making vessels that are a pleasure to use. It was at college that my love-affair with traditional English slipwares began, and I studied them in detail during my final year. Subsequently I have always used slips (runny clays, often coloured with oxides) to decorate my work; though my creative journey has taken me a long way from the original starting point. Ideas changed radically when, on an Autumn walk, my feet kicked up piles of fallen leaves. How beautiful they were - how could I use them? It was a moment of inspiration. A year of experimentation, tests and careful note-taking produced a method of printing leaves onto daubs of slip, contrasting slips brushed over the top. Adjustments to glaze, firing temperature and firing cycle eventually produced the unique effect I was aiming for. My passion for birds led naturally to an interest in plants, insects, and the realisation that everything is interconnected. The dynamic forces which drive this natural world are something I try to convey through my use of leaves. Leaves can represent the endless cycle of birth, death and rebirth. For me it's more than just using them as motifs; on vases and larger bowls I'm painting with the leaves to express my feelings about the unstoppable energy of life. Incremental changes to the work occur all the time via a natural process of evolution, -which seems appropriate for a naturalist.... Next year's work will be different from last year's!